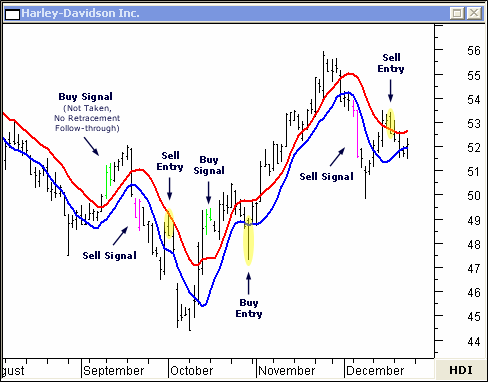 he moving average channel trading method can get you in and out of stocks in a timely manner. 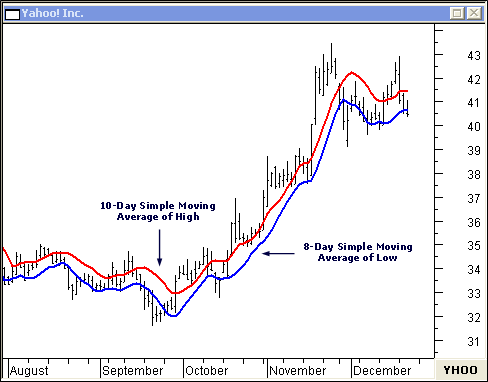 First revealed by Jake Bernstein in his book, The Compleat Day Trader, this trading method uses a moving average channel where trades are taken when the stock price moves in and out of the channel. The channel is made up of two moving averages. The upper boundary of the channel is a 10-period simple moving average of the price high. The lower boundary of the channel is an 8-period simple moving average of the price low. The rules for taking a trade are simple. When price action for two consecutive bars trades completely outside of the channel a position may be taken on the next trading day. For example, a buy signal is triggered when two consecutive bars trade above the channel. Conversely, a sell signal is triggered when two consecutive bars trade below the channel. Sometimes the buy and sell signals can "whipsaw" you in and out of the market. Over time, this will be detrimental to your trading account balance. As with any trading methodology, prudent money management stop loss orders must be used, consistently. So... how can you overcome this common trading mishap? Refinement of your entry signals will help diminish the whipsaw effect. Notice in the Energen Corp. chart once a signal is generated the stock tends to pause or even retrace somewhat. You can use the entry signal as an area of resistance or support depending on the trend of the stock. For example, if a buy signal is triggered wait for the stock to retrace to the lower band of the moving average channel. Once it touches the band and reverses, you can enter a low risk buy position. The opposite works with a sell signal. 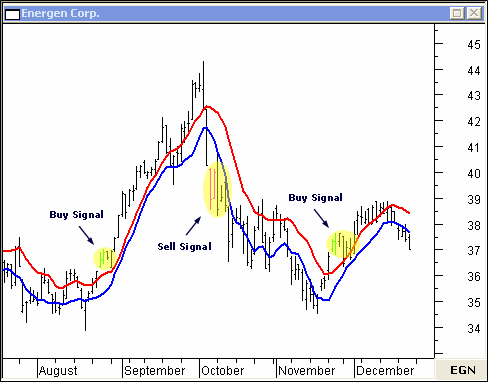 Once the sell signal is generated, wait for the stock to trade to the upper band of the moving average channel. After the stock reverses, you can enter a low risk sell position. With the moving average channel system, you can always be in the market... long or short. On its own, the moving average channel is a solid trading method. Combined with additional technical indicators like candlesticks, Elliott wave, Fibonacci and the relative strength index, the moving average channel becomes a powerful system you'll use often.